The introduction and spread of Palmer amaranth in Iowa undoubtedly will have a significant impact on crop production and weed management in the future. 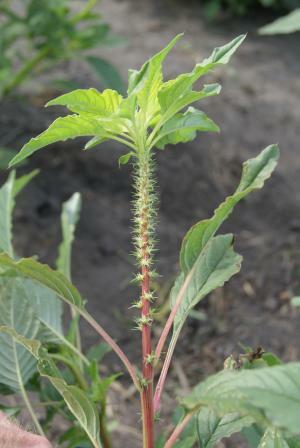 However, since the first infestations were identified I've been intrigued by what seemed odd behavior for a plant with Palmer amaranth's reputation. Most introduced species experience a ‘lag phase’ where they remain at a low level for several years, after this period the plant can spread rapidly throughout the region. The length of the lag phase varies with species, but 20 to 30 years is typical. The lag phase is believed to be due to the need for the plant to adapt to its new environment. Although I have no data to support my observations, I suspect the rate that Palmer amaranth spreads in Iowa at this time is limited by this lag phase. 1) There are often significant flushes of Palmer seedlings in September (assuming favorable soil moisture). Since there is a low probability these plants will produce seed, their emergence will help deplete the seedbank. I rarely see waterhemp emerge this late in the growing season. 2) Most of the fields with heavy Palmer amaranth infestations that I am aware of do not have typical Iowa soils. Iowa’s first infestation was found in a field with a Sarpy fine sandy loam, and the second infestation was in a field with a sand soil in the Cedar River flood plain (Figure 1). Several other significant infestations have been found in fields with sandy soils. While Palmer amaranth has been found in fields with typical Iowa soils, I am not aware of any widespread infestations in these fields. Figure 2. Palmer amaranth in a sand soil in Muscatine County. 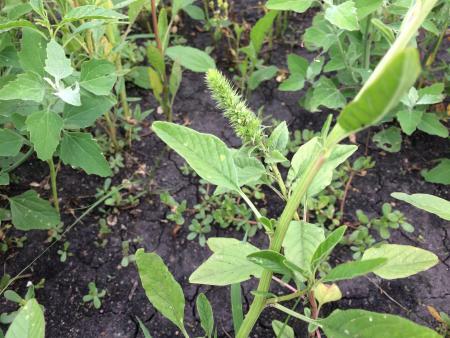 3) Palmer amaranth doesn’t seem to know how to respond to Iowa’s climate. Plants that emerge during May often flower in early-mid June (Figure 2). While these plants successfully complete their life cycle, early flowering dramatically reduces seed production and competitiveness. I’ve observed plants go into reproductive mode in June, only to ‘decide’ it’s too early for this and return to vegetative growth (Figure 3). Again, I can’t remember waterhemp or other pigweeds behaving like this. Figure 2. Palmer amaranth in full flower on June 20. Figure 3. An indecisive Palmer amaranth. Weeds are commonly defined as ‘plants out of place’, and I believe that Palmer amaranth is behaving like it doesn’t belong in Iowa. I’ve been reluctant to discuss this since some people might use the lack of fitness as an excuse not to aggressively attack new infestations. Although Palmer amaranth probably is not reaching its full potential at this time, we know it can survive and spread in Iowa. We should take advantage of this grace period and attempt to eradicate every infestation before Palmer has the opportunity to adapt to Iowa’s climate and soils. It is important to recognize that like waterhemp, Palmer amaranth is very quick to adapt to management practices and other stresses. 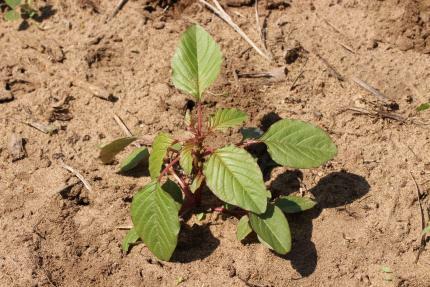 Thus, it is very likely the lag phase for Palmer amaranth will be much shorter than with other invasive plants. Now is the time to identify and eradicate infestations of Palmer amaranth.